Please choose in the menu for further information, send your enquiry or order by using the contact page. A cam chain tensioner allows proper locked tension of the cam chain by avoid jumping of the chain because of failure of standards tensioners. This gives the engine builder more accurate engine timing, enhancing and confidence in knowing the tension is locked properly. The tensioner is produced according to todays high production standards and has proven it's reliability as well as it's quality all over the world. 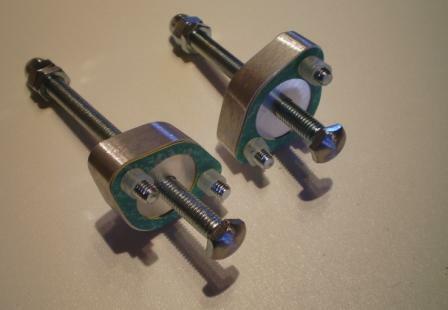 Krieger manual cam chain tensioners are available for many motorcycle brands and types. As the programm is expanding through the years don't hesitate to ask for your requiered manual tensioner if not listed yet. All tensioners are supplied with the proper gasket and a detailed fitting instruction and shipped with registered track & trace service. Use the contact page, don't forget to give full info to avoid any misunderstanding. Payment can be done with PAYPAL or by direct banktransfer, click here for more info . Important: I only ship Krieger cct's to European countries, for all other area's please visit the website of Krieger USA. Prices are incl VAT and within EU no extra charges such as import duties ! Other parts are shipped world wide.